The area incorporates Wanzhou City and Fengjie, Yunyang, and Wuxi counties and has a concentration of places for scientific investigations, explorations, and unknown-seeking. The major spots of scenic value and historic interest are Tiankeng, Difeng, Longgang, Hongchi Dam, Xiabing Cave, and tombs of the Han Dynasty (206 B. C. - A. D. 220) at Tujing. Located on the northern bank of the Changjiang River in eastern Chongqing, Wanzhou is a keypoint on the Three Gorges of the Changjiang River and a vital land and water communications hub in Chongqing. It overlooks the Changjiang River and backs on mountains. Xishan Park is to be found at the southwestern tip of Wanzhou. There are the Luchi Pond, the Liubei Pond, and Xishan Tablet that form a time-honored street park in urban Wanzhou. Shiqinxianglei, a waterfall under Tiansheng Bridge, is one of the "eight scenic attractions of Wanzhou." Located to the west of Wanzhou, the 14-hectare Xishan Park has the Changjiang River in front and the Taibai Crag at back. The park was constructed in 1928. 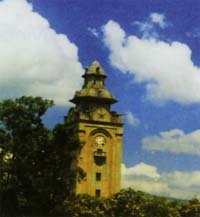 At the entrance stands the magnificent Bell Tower, which is one of the "eight scenic attractions of Wanzhou." 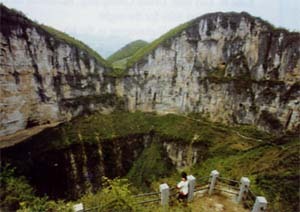 Tiankeng (Heavenly Pit) is a karst depression in Xiaozhai Village, 9,100 meters from the Fengjie County seat. It is 666.2 meters deep, the vent is 622 meters across, and the bottom, 522 meters across. A rarely-seen sight in the world, it is called the No. 1 pit under heaven. This website is developed and managed by www.ChinaPlanner.com, a China travel service provider and a China tour operator. 566 7th Ave, Suite 506, New York, NY 10018, U.S.A. Copyright 1995 - 2003 All Rights Reserved.